Ayelet Shaked rejects Supreme Court ruling, proposes "first registration" to legalize Judea, Samaria. "I will use every means necessary." 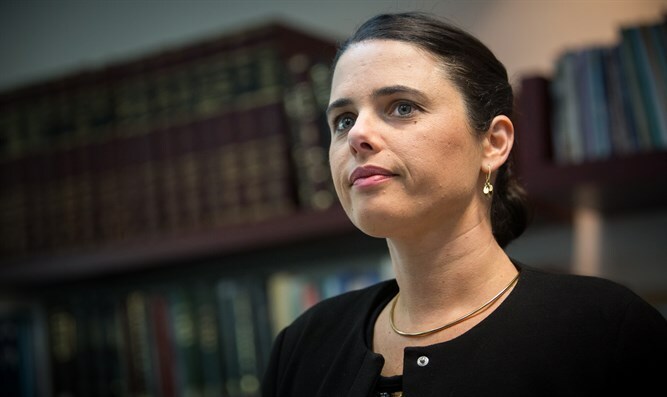 Justice Minister Ayelet Shaked (Jewish Home) fumed Thursday evening over the Supreme Court ruling which orders demolition of another Jewish neighborhood, this time in the Gush Etzion region. "In the last year and a half, the Defense Ministry and the Justice Ministry have been working to legalize [towns in Judea and Samaria] wherever feasible, and the state decided that in Netiv Ha'avot, it was feasible," Shaked cited an earlier state decision to destroy seven buildings in Netiv Ha'avot, a neighborhood of the town of Elazar, while leaving ten other buildings intact. Shaked, though, doesn't believe that the Supreme Court ruling came in a vacuum. According to the Justice Minister, political machinations are driving the destruction of Jewish towns like Amona and Mitzpeh Keramim. "The Supreme Court ruling came after a change in the nature of the response of the state, based on policy changes dictated by the political leadership. "Now, the court wants to give preference to procedure over substance, while ignoring the complex reality of this region." Despite the seemingly unlimited power of the Supreme Court in Israel, Shaked refuses to surrender. "I will use every means necessary, together with the Defense Ministry, in order to advance a "first registration" process, which should allow for the regulation of the homes. The first registration should allow a change of circumstances, and will permit the state to apply for the cancellation of the destruction of the houses." Her confidence in the Defense Ministry may be misplaced, however: Defense Minister Avigdor Liberman promised on Thursday to bow to the will of the Supreme Court in the case of Amona. "We are a country of law, and we will respect our law, whether here or in Amona. We will respect our state and its symbols, and the law as it exists in the State of Israel," Liberman had said. In Israel, Supreme Court Justices are not vetted by the Knesset, but appointed by a committee which includes presiding justices. The Supreme Court does not investigate land ownership, but receives depositions from both sides in a suit. Since the days of Justice Aaron Barak who said that "everything is justiciable," and the advent of Likud governments, the Supreme Court has been the preferred venue of leftist organizations' attempts to destroy Jewish presence in Judea and Samaria. The fact that one does not need to be directly affected to file suit in Israel makes that an easy process for "Peace Now" and other leftist groups.